Happy Friday! As we bring this wonderful week to a close, Jamie Meloni, our host brought some quite interesting guests on today for our listeners! If you missed out the #MorningAir conversation, feel free to head over to http://www.tampabayradio.com to listen to any show on demand! Also, did you know #ThatBusinessShow is on iTunes? Look us up! Alternatively, if you wanted to see the show’s live footage, head over to Jamie’s YouTube Channel at http://www.youtube.com/jamiemeloni for the #InsideScoop! Today on #ThatBusinessShow, we welcomed Paul Swindle, Managing Partner of Relocation Strategies – Tampa Bay. On the second segment, we also had Katharine Eagan, Chief Executive Officer of HART! For non-Tampa natives, HART is otherwise known as the Hillsborough Area Regional Transit Authority. Thank you for joining Jamie Meloni, Host of #ThatBusinessShow every weekday at 8am on #1250whnz and taking time to support the show! 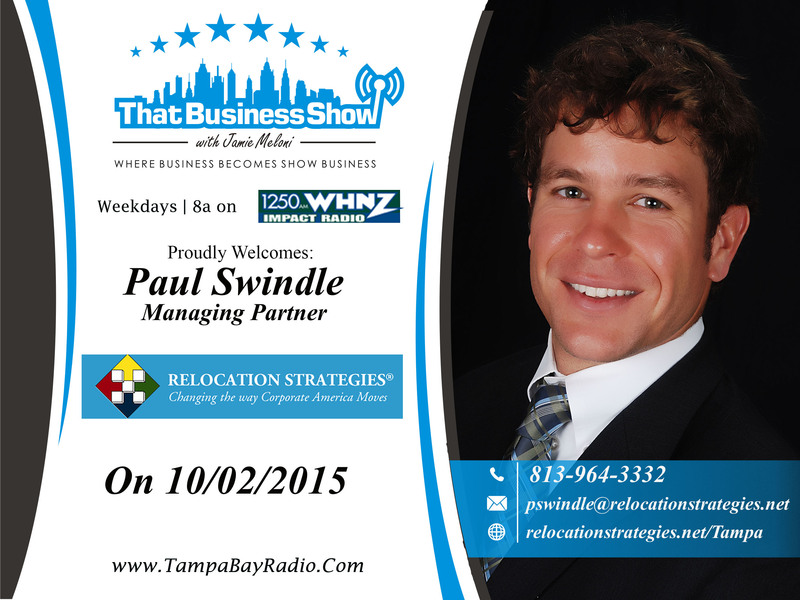 First up on #ThatBusinessShow was Paul Swindle, Managing Partner of Relocation Strategies – Tampa Bay. His responsibilities include operations management, relocation consulting, project management and business development. Relocation Strategies – Tampa Bay helps businesses in a crucial time, expansion! During times like these, an efficient plan is needed to make the transition to the new location seamless and quick, allowing work to continue – which is where Relocation Strategies – Tampa Bay steps in! Forming an effective plan based off the client’s business method, they make sure every connection is fulfilled right down to the fax machines! They even handle employee transportation between the new and old locations! You can contact Paul Swindle and Relocation Strategies – Tampa Bay at http://www.relocationstrategies.net/tampa/. 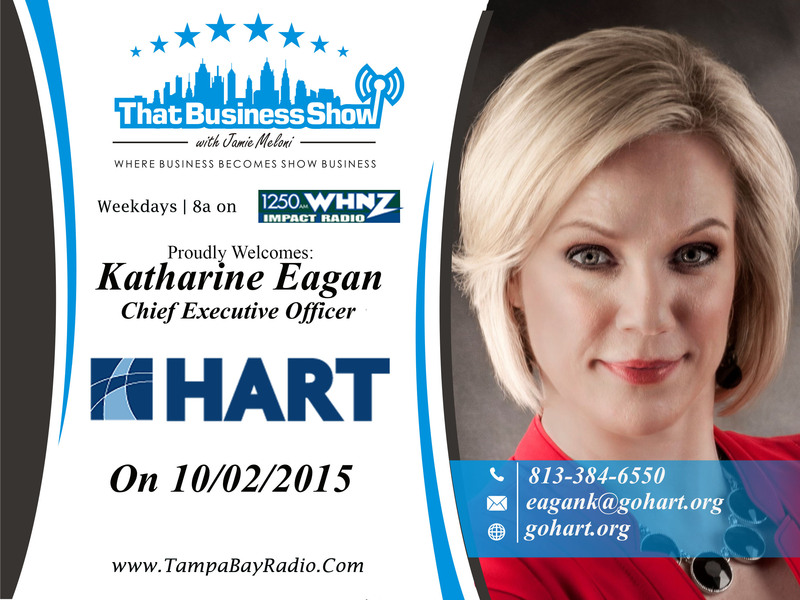 Katharine Eagan, Chief Executive Officer of HART joined us on #ThatBusinessShow on the second segment. HART provides nearly 50,000 passenger trips a day and about 15 million trips a year. Katharine and Jamie discussed the expansion of the company under her leadership, with ridership increasing by 23%! HART #HelpsOurCommunity get around, and has become quite the familiar name over the years. For future riders, they offer many packages and coverages – all which you can find on their website at http://www.gohart.org/. This entry was posted in Articles, Entrepreneurship and Business and tagged blog, business, entrepreneur, radio, show business, talk, transport, work. Bookmark the permalink.